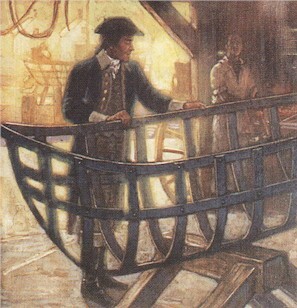 From March 19 to April 14, 1803 Lewis instructed the arsenal workmen at Harper's Ferry, West Virginia how to fashion his "dismantlable" iron frame. It was a unique concept, entirely Lewis's, and his pet project. During the first year of their trek across the continent (1804-05), Lewis and Clark carried the dismantled frame of a collapsible boat. Designed by Meriwether Lewis, the frame could be bolted together and covered with animal skins. The boat would be used in inaccessible areas, when the heavier wooden boats were left behind. Unfortunately, tar was required to make the invention waterproof, and by the time the expedition needed the boat, in the vicinity of Great Falls, Montana, there were no pine trees to provide it. Attempts to contrive a substitute were unsuccessful; the boat leaked and could not be used, and dugout canoes were made instead. The collapsible boat was left behind in the mountains (Cache location ) . There is some debate over whether it was recovered and hauled back to St. Louis or left in a cache in the Great Falls area.